More and more canyons in Kullu-Manali Valley. The Himalayan Canyon Team members (HCT) discovered and route settled an amazing canyon nearby Manali City. It is located in the deep end of Kanyal Valley, facing the North pole. The road drives you to Kanyal village and then for at least 2hrs you have to walk up until crossing a crystal water river coming from the far top of 5000m peaks. The water looks to be very cold! This canyon is formed out of a first 20m high waterfall finishing in a deep pool hanging on a top of a high vertical of 150m. 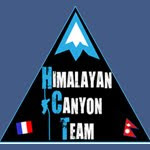 To explore it, we use the Himalayan Canyon Team approached techniques. Those techniques have been developed and used since our first Nepal expedition in 2004. They consist in an extreme Team organisation and technical knowledge allowing us to save as much as we can the time spent to cross the canyon from top to bottom. We have a leader team of two members. They have to go ahead and decide about the belay station location under a certain numbers of technical constraints. They have to setup the rope and prepare the belay station for the closing team. Coming after the leader team, two members are located in the middle and they have to play the relay between the ahead team and the closing team. They are feeding the ahead from the equipment collected from the closing team. The closing team has to clear the route as fast as possible and send all the technical gears to the front team in order they can continue they canyon exploration. This time in the leader team, Jeanluc Jubert, Director of Top Rock Adventures and permanent member of HCT, went the first to explore this canyon and rappel down from the far top into the first pool. At that moment he felt down into this deep pool surrounded by very slippery rocky side bank. He spent approximately 3 to 4 minutes into 4°C freezing pool water trying to get out by any how. His face and hands were red color turning towards the dark purple! Suddenly he succeeded to climb in fragile manners and stabilized himself on the side bank under the waterfall. The rock slipperiness and the weight of the waterfall (approximately falling at a speed of 40l/second) pushed him into a very danger position on the top of this huge jump!! Loaded with 4 ropes bags, wireless drill machine, bolting equipments he drilled a first bolt to start a side crossing line. Soon, Yann Ozoud, HCT foundator members and canyoning expert, joined him to give him support. Jeanluc start to cross from one bolt to the other one until he reached the far end of the cliff above the main deep waterfall. At that point, Jeanluc fingers’ were entirely freezes and bleeding. It was impossible to work any more and to drill more bolt. He had to give up and claim for more support from other team members. The next waterfall was impressive and pushed Jeanluc to take the right decision to let Rodolphe Sturm take the lead. In a very technical, accurate and fast manners Rod, went ahead and found the access rappelling way to begin with the first meter steps. In one fractio and 2 belay stations Rod found the way trough this very technical and broken rocky face and touched the ground of the 150m waterfall. The way leads you on the left side of the river bank and the belay stations are located under good shape size overhang. When we all reach the bottom, our local friends Raju and Vridge were waiting, watching us with incredible and unbelievable eyes. They were questioning themselves: “But, what are they doing their? What for? What are they looking for? Some questions to which we cannot give any answers! Any kind of mountaineering sports involves risk and passion. Nobody has an answer and each and everybody has his own reason to enjoy it. In our case, while we are practising canyon in extreme condition of climate, temperatures, altitude, location, it gives us an extreme competence in rescue techniques and Search and Rescue expertise. Based on fun activity, we have developed a very sensible and efficient rope, Search and Rescue techniques. Those techniques are applicable in extreme emergency and in any kind of situation while the rope access is concerned. Invited by the Himalchal Pradesh Government, Jeanluc Jubert taught these techniques during the SAR training program leaded in Bhutan on the behalf of the United Nation Disaster Program(UNDP) and the Bhutanese government. In 12 days time the trainees became qualified and ready to save life in any kind of situation or location. Whom ever wants to follow those professional training programs should get in touch with our agency. Finally, it took us 2hrs to go trough the canyon. The bone fire waiting for us at the arrival was a kind of providence!! Une balade picturale autour des blocs de Solang, Manalsu, Vashisht, signée Elie Chevieux . Un nouveau site d'escalade à Manali!! Le site de Bloc de Solang nala est Sauvé!!! Expédition Canyon au Népal “Chamjé Khola 2011” A l'assaut d'un Monstre!! Thai Tanium Project - Thailand Rebolting. Rock Climbing Topo Guide available at Top Rock Adventures Library in India. Top Rock Adventures est une société indienne fondée par des Français passionnés d'escalade, d'alpinisme et conquis par l'Inde. Grâce à Top Rock Adventures, ils font découvrir aux Indiens et aux étrangers, les sports de plein air et l'aventure en Inde et en Himalaya. 5000 visites, on repart à 0 !